No need to cook these lasagna noodles ahead of time. 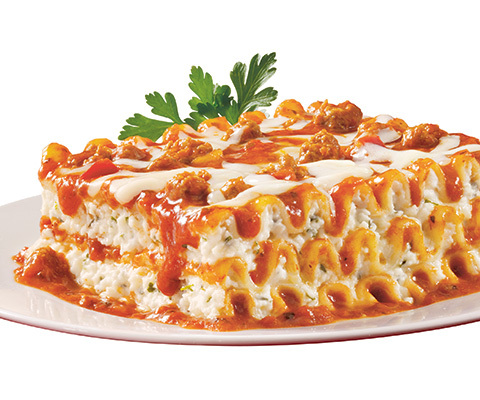 To save even more time, prepare Lasagna up through Step #3, cover and refrigerate until ready to bake. Preheat oven 350°F. Mix together ricotta cheese, Parmesan cheese and eggs in a medium bowl. Cover and set aside. In a large skillet over medium high heat, brown sausage for 6 to 8 minutes, or until cooked through, stirring until small crumbles form. Spread 1 cup of Pasta Sauce evenly over the bottom of 13x9 baking dish. Layer with 1/2 of lasagna noodles, 1/2 of ricotta cheese mixture, 1/2 of cooked sausage, 1/2 of remaining Pasta Sauce and 1/2 of mozzarella cheese. Repeat layers and sprinkle parsley on top. Cover tightly with aluminum foil and bake for 1 hour. Remove foil and bake for additional 15 minutes, or until hot and bubbly. Allow to rest for 5 to 10 minutes before serving. For a little extra kick, substitute Classico Four Cheese Pasta Sauce with Classico Spicy Tomato & Basil Pasta Sauce. My 13 x 9 glass baking dish takes 5 noodles per layer (4 horizontally, one vertically with the end trimmed). Therefore, I use 15 noodles not 8 noodles as per your recipe. (I usually have about 4 of the no cook noodles left in the box afterwards). I like to make a meat sauce with a mixture of ground beef and ground pork, brown and drain it, then add 2 bottles of Classico Sweet Basil Marinara (or sometimes a mix of The Marinara with the Roasted Garlic & Onion or Fire Roasted Tomato & Garlic). I use smooth ricotta mixed with one egg and a little basil and Parmesan (but I only put it on the middle layer, not all three layers). After the last layer of noodles is added, I add a small jar of Classico Alfredo on top and more mozzarella. Everyone raves about my lasagna. They love it!